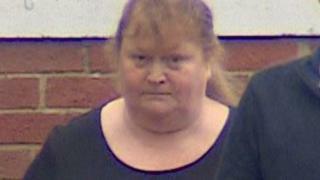 A care home manager has been jailed for eight months after stealing hundreds of pounds to play bingo. Gloucester Crown Court heard Rachel Stokes, 48, used cash cards to withdraw the money from the bank accounts of vulnerable residents in her care. Stokes admitted to police she had used the money to fuel a gambling addiction. The court was told Stokes looked after about seven residents in a care home in Gloucestershire, which cannot be identified for legal reasons. She often used cash cards to legitimately withdraw money from the bank accounts of residents unable to do so themselves. An audit by Gloucestershire County Council in 2013 revealed money from accounts of three of the residents did not tally with records of cash withdrawal. The court heard she withdrew £200-£400 each month and used some of it to gamble. She admitted to stealing £1,000 in total, but according to prosecutor Julian Kesner, that was the minimum figure she took. Stokes admitted three charges of defrauding three vulnerable people in her care between 2012 and November 2013. Speaking after the hearing, a family member of one of her victims said Stokes should have been given a tougher sentence. "I am not happy. We definitely needed longer," she said. "There are just no words to describe what she has done."